France - I Say Ding Dong Shop - Buy Stickers, Decals & Unique Automobilia. 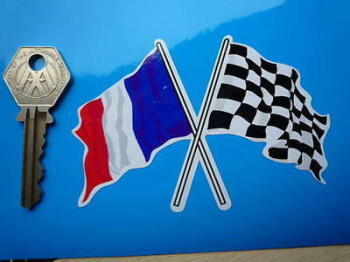 Crossed French & Chequered Flag Sticker. 4". Crossed Union Jack & French Flag Sticker. 4". 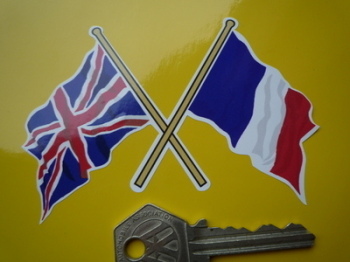 France Fade To Black Oval Tricolour Flag Sticker. 4". France Fade To Black Oval Tricolour Flag Stickers. 3" Pair. France Tricolore Flag Helmet Visor Sunstrip Sticker. 12". France Tricolore Worn & Distressed Style Helmet Visor Sunstrip Sticker. 12". France Volkswagen Beetle Travel Sticker. 3.5". France Volkswagen Campervan Travel Sticker. 3.5". 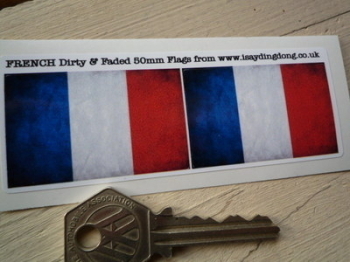 French Dirty & Faded Style Flag Stickers. 2" Pair. French Flag Splat Style Sticker. 6". French Flag Splat Style Stickers. 4" Pair. French Flag Stickers. Set of 4. French Girl Standing in France Tricolore Flag Bodysuit Sticker. 3", 4", or 6". French Wavy Flag Stickers. 2" Pair. 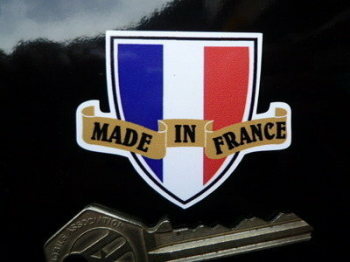 Made in France Shield & Scroll Sticker. 2". Made in France Tricolore Oblong Stickers. 1.5" Pair.